As we started working, we quickly discovered that quite a few of our coworkers had either built games like this before or were game aficionados (aka. 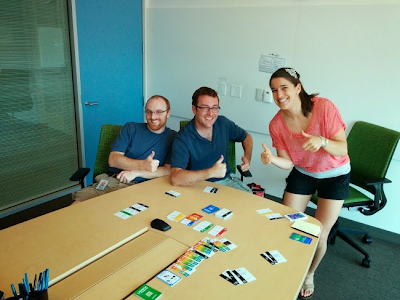 the group of Googlers who meet up weekly to play board/card games). They provided guidance as we set out goals for the game (first and foremost, it had to be fun!) and general insight as to how long this whole process would take. After a few months of developing the game dynamics (and building an automatic card generation pipeline, of course), we put an early version into the hands of interns to get some real feedback. Based on their comments, we continued to iterate (pun intended) and make changes to ensure that the game was still satisfying our initial set of goals. We introduced the game to more Googlers to continue collecting feedback, then took the game to the University of Texas at Austin for a true beta test. Feedback continued to remain positive, so we decided it was time to launch the game on a broader scale. The team playing one of our earliest versions of the game (in black and white!). 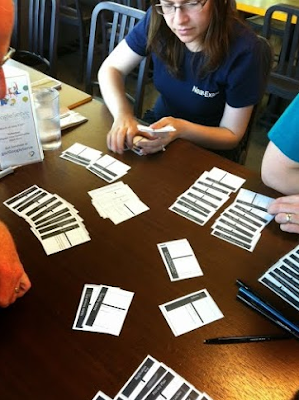 Launch & Iterate is a team cooperative card game with the goal of launching products in order to gain as many users as possible. In order to successfully launch products, players must develop the necessary infrastructure and features while keeping an eye on external events, which might help or hinder efforts. We created a video tutorial where you can learn more about how the game is played. Celebrating after we beat the game for the first time. Launch ALL the products! We’ll be bringing Launch & Iterate to university campuses globally over the next few months, so keep an eye out. You can learn more (and review the game if you get a chance to play it!) on our Board Game Geek profile. “What would be a fun way to show students what it’s like to work at Google, rather than just tell them about it?” My manager asked me this question a little over a year ago as we started planning for the upcoming campus recruiting season. Tech talks, career fairs, info sessions — these were our bread and butter events, and we knew there was a missed opportunity to come up with some more creative and innovative programs. In typical Google fashion, my initial step was to get a few engineers in a room to brainstorm ideas. Some of the more obvious ideas were thrown out — host a hackathon, coding workshop, bring students to a Google office, etc. Then Eddie (the engineer who ended up leading this project) suggested, “Why not build a game that mimics what it’s like to launch a product at Google?” We all sort of laughed, then quickly realized this was a pretty genius (but daunting!) idea. We rallied a group of engineers to take this on as a 20% project, and the game took on a life of its own.